An incident took place in early July 1947 outside Roswell, New Mexico where a rancher discovered unidentifiable debris in his sheep pasture. Officials from the local Air Force base claimed it to be crashed weather balloon while several believed that it was the remnants of an extra-terrestrial flying saucer which were a series of dummy drops during 1950s in New Mexico. Fifty years after the mysterious debris incident, the U.S. military then issued a report related to the incident to a top secret atomic espionage project known as Project Mogul. Several people still continue to believe the UFO theory and hundreds of curious seekers tend to visit the crash site of Roswell each year. Another version of this incident state that on the evening of July 3, 1947, a respected business owner, Dan Wilmot together with his wife were seated on their porch in the front area when they envisaged a bright saucer shaped object having glowing light moving across the sky at a speed of 400-500 miles per hour. Wilmot had estimated the unidentified flying object to be about 20-25 feet away and the object seemed to appear from the Southeast which disappeared to the Northwest. 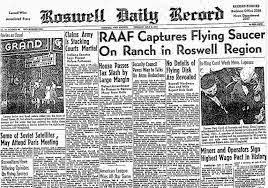 He had reported this unusual sight to Roswell Daily Record. Another source states that in early July, the Foreman of the J.B. Foster Ranch, W. W. Mac Brazel had been out checking his sheep after a night of intense thunderstorm when he discovered a huge amount of unusual debris all across the ranch’s pastures. He had taken some pieces to show them to some friend and neighbours and had got in touch with Chaves County Sheriff, George Wilcox. Suspecting the material found by Brazel to be connected with military operations, Wilcox had notified the authorities at Roswell Army Air Field for further action with regards to the issue. After the initial point of interest, the report from the military claimed that the crash could have been of a conventional weather balloon and its interest died out till the late 1970s when ufologists started circulating a number of elaborate conspiracy theories stating that one or more alien spacecraft had crash landed and the extra-terrestrial occupants were recovered by the military. 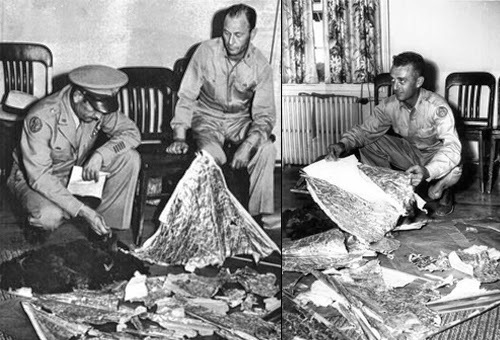 The U.S military had published reports regarding the true nature of the crashed Project Mogul balloon in 1990s but the incident continues to be a popular media interest together with the conspiracy theories that surround the event and Roswell has been known as `the world’s most famous, exhaustively investigated as well as thoroughly debunked UFO claim’. The events’ sequence was activated by the crash of the Project Mogul balloon. The Project Mogul team had invented a number of high tech materials for the balloon together with other equipment which included the ultra-lightweight as well as ultra-strong metals, fireproof fabrics and fibre-optic cables and could be part of the reason of their belief when they saw the debris and thought that they had come from outer space. It was something which they had not seen before though most of these materials are being used till date. Several books and articles have related about Roswell and many who have read them have found the same quite confusing with different competing versions that have been conveyed with each being contradictory and the mystery is yet not unravelled.